2016 has been FIRE’s busiest year to date. This year, FIRE saw an unprecedented decline in the percentage of universities maintaining written policies that severely restrict students’ free speech rights. It’s the ninth year in a row that this percentage has dropped. Additionally, 17 schools or faculty bodies adopted statements in support of free speech modeled after the one adopted by the University of Chicago in January 2015. Through it all, our 15,000-member FIRE Student Network (FSN) has been at the forefront of the fight for freedom of speech at our nation’s institutions of higher learning. Without the hard work, passion, commitment, and drive of these students, FIRE’s success would not be possible. For those who are not familiar with the program, the FIRE Student Network is a coalition of students who recognize the importance of advancing civil liberties on their campuses. Joining the FIRE Student Network is the best way for students to stay in contact with FIRE, work with us in the future, and take advantage of our many resources. Over the last 12 months, FSN members have brought speakers to dozens of campuses both to challenge the status quo and to debate free speech on the merits. Additionally, FSN members published op-eds in their campus newspapers, held free speech-themed events, lobbied their student governments, and more. All the while, FSN staff dedicated substantial energy to building resources for students, hosting conferences, debates, and training sessions, speaking with students on the ground, keeping them updated through our campus alert email system, and connecting them with expert FIRE speakers for campus events. While threats to free speech at colleges and universities across the nation remain dire, FSN members demonstrate time and time again that they are ready and willing to fight for their rights. Learn more about just a handful of FSN’s most successful initiatives from the past year. This past spring, FIRE hosted a one-day event offering students a crash course on the First Amendment, with an emphasis on the right to campaign on campus. Workshop attendees learned about the history of censorship on campus and the forces at play in the current struggle against restrictive speech codes. Participants also worked closely with FIRE staff to develop winning strategies for confidently campaigning with the knowledge that the First Amendment will protect their right to speak and be heard—not just during campaign season, but every day. In conjunction with the workshop, FIRE released a policy statement that reminds students and faculty of their rights—and puts colleges on notice about their obligations to abide by the First Amendment or their promises of freedom of expression during election season. We also authored a useful FAQ for Student Protests on Campus. Also in the spring, FIRE hosted the final two debates of the FIRE Debates series. FIRE Debates was founded with the goal of demonstrating to students the essential role free inquiry and open discussion serve in both education and democracy. After a long search, hundreds of applications, and dozens of interviews, FIRE brought on ten exceptional interns this past summer. FIRE’s Summer Internship program gives current undergraduates the opportunity to assist FIRE in defending civil liberties on campuses across the country. Our interns assisted in nearly every aspect of FIRE’s mission, making substantive contributions in the battle for free speech, and learned a great deal along the way. They also enjoyed weekly seminars with FIRE staff and a number of the nation’s foremost experts on freedom of expression, due process, and much more. Additionally, FIRE’s interns were essential to organizing our summer conference and even ran their own breakout session. The FSN team is already busy with applications for next summer’s program. Apply today! In July, more than 100 students representing institutions from coast to coast, including the University of Connecticut, the University of Florida, the University of Southern California, and the University of North Carolina, gathered in Philadelphia for the 2016 FIRE Student Network Conference. Set at Drexel University and the National Constitution Center, the conference was jam-packed with discussion, information, and resources for promoting individual rights on campus. Students worked closely with FIRE staff to explore current free speech challenges and develop effective strategies for combating censorship at their schools. In addition to comprehensive workshops led by FIRE staff members, students learned about the experiences of keynote speakers Alice Dreger and Jason Riley. Students should keep their schedules open for next summer’s conference! After FIRE created a pocket-sized Constitution for student activists, we had to work overtime to satisfy thousands of orders. Since our last big push, students across the country used our Constitutions to learn about and exercise their rights on campus. There’s still time to order yours! You may have seen students across the country staging free speech wall events to promote open discourse and dialogue. With institutions nationwide limiting student speech, it’s more important than ever that students understand and assert their rights. 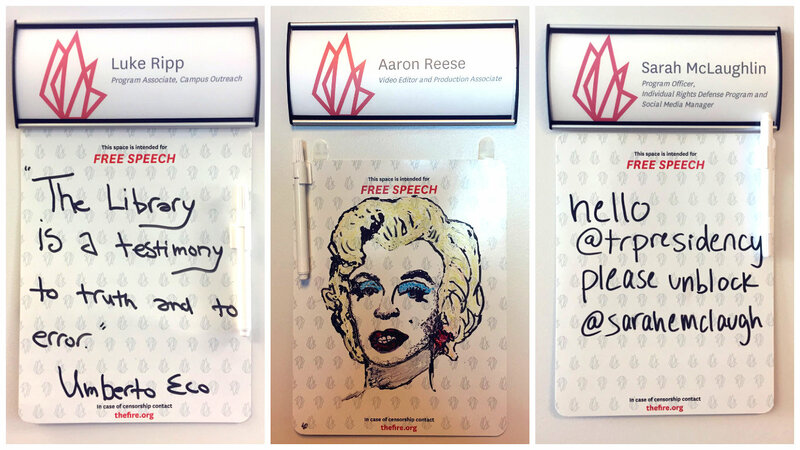 Seeking to counteract this trend, we designed mini “free speech wall” whiteboards to encourage student expression on campus. The whiteboards also include an important reminder to contact FIRE if students face censorship. So, how do you get your hands on these whiteboards? All you have to do is fill out this simple request form using your .edu email address, and we’ll send one your way. FIRE is proud of the accomplishments of the FIRE Student Network. The coming year is sure to bring a host of fresh challenges, but we are confident that FSN members across the country are ready to fight. As always, FSN staff stands by with the resources necessary for students’ success.